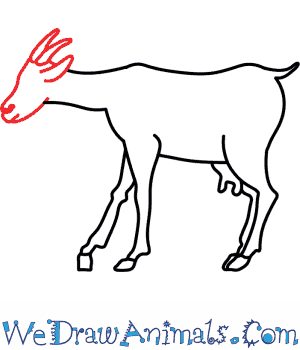 In this quick tutorial you'll learn how to draw a Goat in 11 easy steps - great for kids and novice artists. At the bottom you can read some interesting facts about the Goat. 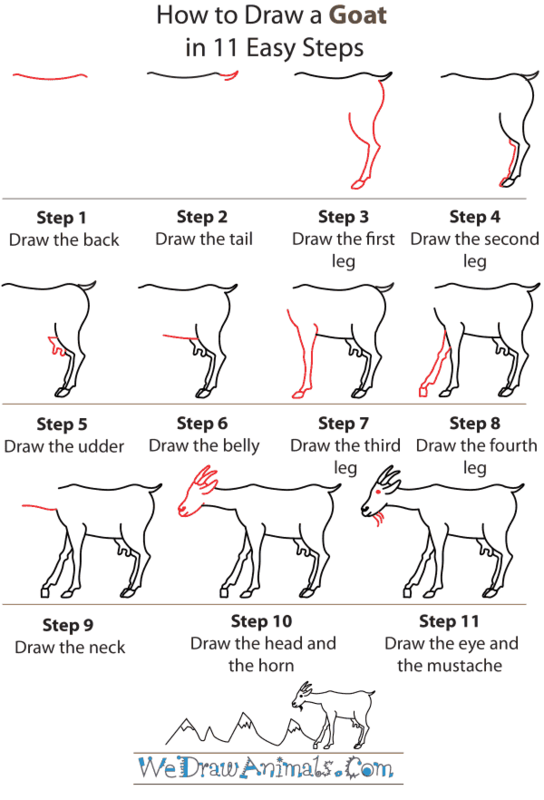 Step 1: Let's draw a goat! Trace a curbed line across for the back. 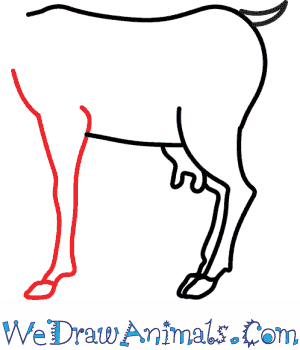 Step 2: Add a pointy tail that almost looks like a letter V.
Step 3: Trace the first hind leg, making the top half curvy and thick, and the bottom half, straight and skinny. 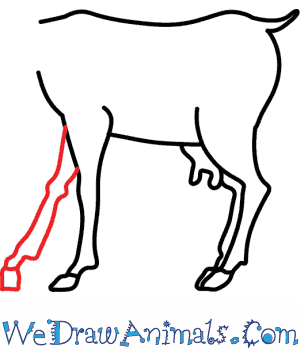 Step 4: Trace the second hind leg alongside the first leg. Trace a line across the bottom for paws! 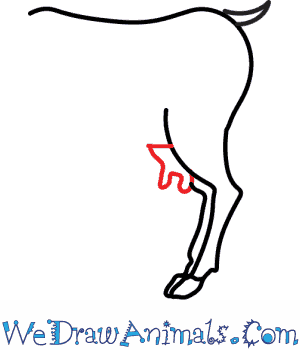 Step 5: Trace an upside-down semi-circle in front of the hind legs and add little letter Us for the udder. 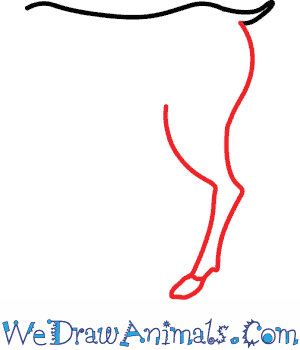 Step 6: Trace a line across the bottom for the belly. Step 7: Trace uneven lines for the first front leg. 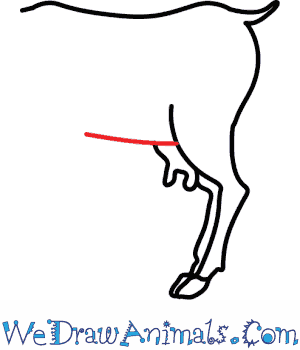 This one is a bit thicker at the top than at the bottom, but it is still thinner and longer than the hind leg. 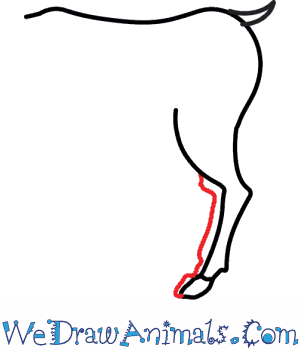 Step 8: Draw the second front leg by tracing long, uneven lines coming out from behind the first front leg. 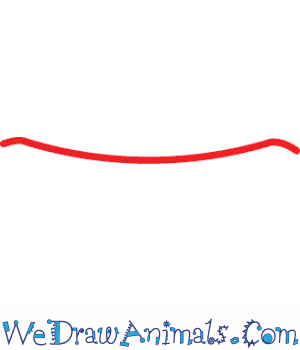 Step 9: From there, trace a short line to complete the neck. Step 10: Draw a skinny oval shape for the head, a line for the mouth and color in a nose. 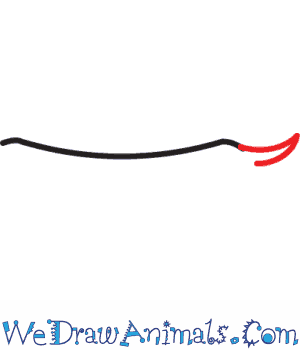 Draw the triangle-shaped horns close together, and the ear right next to them, making it an upside-down letter V.
Step 11: Finally, add a dot for the eye and three lines on the chin for a mustache. There's your goat! Goats are members of the Bovidae family, and they are closely related to sheep. They are one of the first animals in the world to be domesticated by humans. 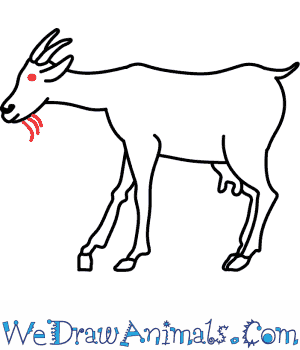 More people in the world consume milk from goats than any other animal. People also eat goat meat and cheese. A group of goats is called a trip, herd, or tribe. The group is usually led by a female. 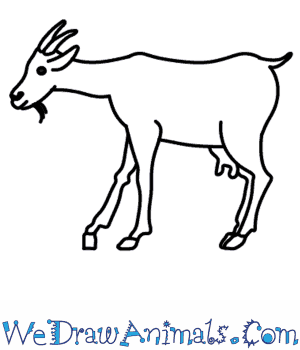 A male goat is called a buck or a billy goat. A female is called a doe, and a baby goat is called a kid. Some breeds of goat can jump as high as five feet in the air. Goats live for about 8 to 12 years. In North America, Texas has the largest population of goats. In Asia, China has the largest. 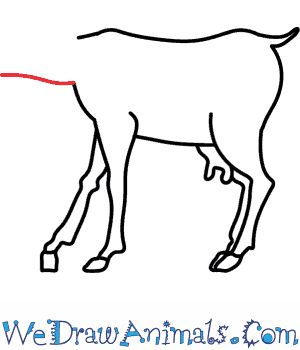 Despite popular belief, goats actually do not like to eat tin cans. This myth came about because people might have seen goats eat the labels off of the cans because they like the taste of the glue. Another rumor is that goats helped in the discovery of coffee when one goat ate a plant and became quite energetic afterwards.